Buy Non-Stop cheaply from Amazon or read more articles on film and television. You too can earn money from writing articles by signing up for InfoBarrel. 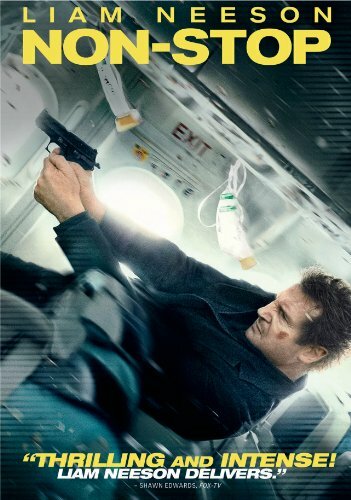 In Non-Stop Bill Marks (Liam Neeson) is a U.S. Federal Air Marshal - a member of the U.S. law enforcement agency designed to protect aeroplanes from terrorist and other attacks, which means he can carry a gun onto the plane - but it also appears he has some personal problems. At the beginning of the film he is stirring what appears to be whiskey into a coffee, before using a breath freshener to hide the smell of alcohol on his breath - and this is just before he starts work, so he would appear to be doing his job whilst under the influence. The impression is given that he has suffered some sort of personal tragedy that has deeply affected him. Whilst he is waiting in the airport to board the plane, a number of "suspicious" looking characters are seen, but it's not going to be as simple as that to figure out who is going to be behind things. Marks's plane is flying to London and it turns out that this Air Marshal is ironically scared of flying - or at least the bit where the plane takes off. Shortly after takeoff Bill receives a text message on his phone, from a federal network that is for the use of the marshals themselves. The sender states that he will kill someone on the plane in 20 minutes unless US$150 million is transferred into their account. Credit: https://en.wikipedia.org/wiki/File:Non-Stop2014Poster.jpgNot knowing who is sending it, this seems like it is going to be some sort of sick joke - until the first person dies. Then, whoever is making the threats promises that another person will die in another 20 minutes, and the threat becomes real. Marks isn't familiar with most of the crew on this flight, with the exception of Nancy (Michelle Dockery) and without knowing who is making the threats, he finds it difficult to trust anyone, apart from the person sitting next to him, Jen (Julianne Moore, The Hunger Games: Mockingjay - Part 1, The Hunger Games: Mockingjay - Part 2), because he can at least be certain that she wasn't sending the text messages. Whoever is behind this knows a lot of details about Bill's personal life, which is suspicious in itself. Things get more complicated when it turns out that the account into which the money is supposed to be transferred is in Bill's name. He becomes the suspect, both in the air by the other passengers, and on the ground by both his superiors and, as footage of the events on the plane appears on the internet, by the news agencies too. Marks is rapidly suspected of trying to hijack the plane himself, given his personal issues, and the problems in hi history are dragging out and publicised. Finding a bomb on the plane turns the situation from bad to worse. In an interesting gimmick, when Bill is reading text messages on his phone, the messages are displayed on the film itself, in front of some things but behind others. When the messages are viewed on a phone with a broken screen, the popups on the film are also damaged as if they are actually being read on a broken screen. Liam Neeson became an action hero rather late in his career, and is certainly one of the older ones around, but he cuts quite an imposing figure as such. He may not be heavily muscled, but he is tall and projects an air of competence into the action scenes he does, especially when his voice is taken into consideration. He is certainly a pretty believable action star. Non-Stop is a decent thriller with some twists and turns, all being played out in a comparatively small, enclosed area which no-one can get into and out from, creating an air of tension when the unknown hijacker - or whatever they are - is still able to do what they say they will. IB likes to feature new film releases on the day they are released in the U.S. if possible. They feature some other articles as well if it's sort of time-sensitive - namely, when the biggest spikes of people looking for them tend to happen. Thought the movie wouldn't do so well with the 55% rotten tomatoes rating. Who knows. The IMDb rating is pretty high though. Higher than mine in fact. Liam is one bad dude. I think I'll check this out! I liked it. I like him as an actor too. I just watched this film, it was average in my opinion. Good article though. Thanks! I didn't think it was as good as Taken, but still pretty decent.